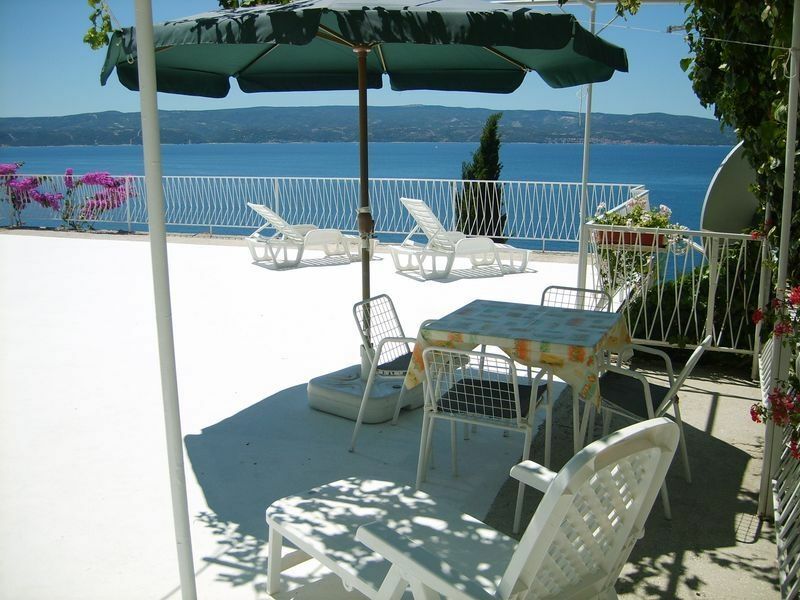 The idyllically overgrown holiday home is located in the spectacularly situated coastal and holiday resort of Omis in central Dalmatia, only 25 km south of Split. The house is built on a hillside and can be easily reached by paved roads. It offers in the approximately 160m ² outdoor area different levels with lush terraces, which can be used by all guests. The flat roof of the house offers a huge viewing and sun terrace with outdoor shower, sun loungers and toys for children. An outdoor grill is also available and is available to the guests of the house. Pleasing is certainly the free Wi-Fi Internet access. The house offers 4 smaller apartments for max. 3 persons. All apartments have their own outdoor area / balcony or terrace with stunning sea views and a view of the 1km long sandy beach of Omis on which for several years the International Blue Flag has been blowing, which stands for excellent beaches, infrastructure and water quality throughout Europe. One of the apartments is separated in a bungalow behind the main house. The rental units have no washing machine, but on request the washing machine of the nice landlord can be used free of charge. The entire tourist infrastructure is located in walking distance, with a maximum duration of 2-3 minutes, whether you want to go to the restaurant, to the shop, to the bank, to the post office, to the doctor or to the pharmacy. The beautiful stone-paved old town of Omis with all its winding streets, Venetian stone houses and churches is reached in 2 minutes on foot. The small harbor, the starting point for many a boat trip, you walk just 2 minutes. Vor allem die sehr freundlichen, hilfsbereiten Gastgeber,die Lage zu Altstadt und Meer haben uns gut gefallen!Super Preis-Leistungsverhältnis! Vielen Dank für Ihre freundliche und positive Bewertung. Es würde uns freuen Sie wieder bei uns begrüßen zu dürfen.